Much of the action on our website occurs on our blog, The Wages of Wins Journal. About once a week we post updates at the WagesofWins.com. At our blog, though, our comments come more frequently. 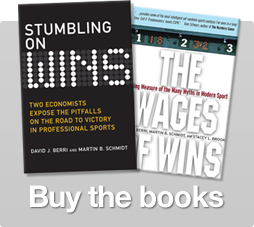 For those who found The Wages of Wins Journal via Malcolm Gladwell’s blog or the recommendation of Business Week, you can find more information on The Wages of Wins at our homepage. Here at The Wages of Wins Journal, you will find frequent comments connecting the stories told in the book to events currently happening in the world of sports. Hopefully everyone finds our musings to be at least interesting, and at best, able to increase your understanding of both sports and economics. 3 Responses to "The WagesofWins.com"
I only wish that it were possible for these economists to pursuade some Stanford billionaire to take over the Golden State Warriors, and put their ideas to a test in the real world (perhaps the gentlemen from Google could bring their “do no evil” paradigm to the poorly run franchise). Unfortunately I think the results would more closely resemble LTCM and the academics would again learn the lesson that statistical information that tells a story about what has happened is no replacement for human judgment. The Heat will win the NBA title this year and that is because of Shaquille O’neil’s influnce on the referees. This cannot be quantified easily. How do you interpret one team forcing the other intp a zone defense and the resulting change to the tempo if the game. Basketball is a game of streaks or runs and the idea that the numers reflect how this plays out is misleading. The winning team only neads one point and that is lost on all of the other competing factors. As a sports econ. student, I have many friends that voice a similar opinion to James’. Infact, Stanford billionaires aside, there are plenty of sports economists that are employed by professional sports teams. And at the end of every year, many will lose their jobs with professional teams and move back into academics. However, that does not mean that the economist’s ideas are faulty or mis-used. It just means that in a given year, for a given team, they won or lost, and some owner decided they could do with or without an economist. Personally, If I were an owner of a sports team, I would employ plenty of economists. First, they are easy to yell at, a fine patsy to take the blame, and as most are not personable, so they are unlikely to show up at a press conference to present their side of why things went wrong. If you pin a lossing record on a coach or player, they are bound to rip back at the owner. So the lesson is, when all else fails, blame the economist! Just remember, one year, the Lakers could not be stopped until they lost, and the Yankees could not be stopped until they lost, and TIger Woods was the best until, well, until he started losing. Lets not forger about the Patriots, who were the best until, umm, they lost. And behind all these loses, is one sports economist being blamed for it all. I’m in the middle of setting up a tipping competition for the Soccer World Cup in June and there is currently a dispute over the relative point value to be assigned to tipping a draw versus tipping a win. Based on previous world cup tournaments (and soccer matches in general) does it make sense to make picking a draw worth more or less than picking a win based on the relative probability of each outcome? If so by how much should the two values vary? (i.e. should tipping a draw be worth 3 points and a win 2, etc?). Can someone with more knowledge of numbers than me settle this for us?